Currently Region 19’s 2016 Silver medalists, Neon Lights’ musical journey began in October 2014. Even though they are a relatively new group, these women are no strangers to the stage. 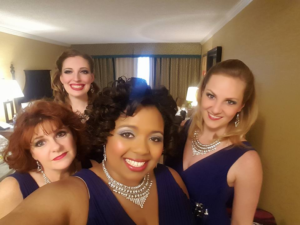 Filled with many backgrounds including classical, musical theater, opera, and of course barbershop, this vibrant quartet is very versatile and loves ringing chords in a variety of genres. 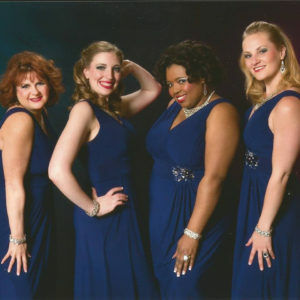 Their repertoire features songs from Broadway musicals, Fleetwood Mac, Ella Fitzgerald, Michael Buble, and more! Visit their website for more information, and if you would like to contact or inquire about booking Neon Lights email them at NeonLightsQuartet@gmail.com. They would love to sing for you! Marianna started singing Barbershop when she was 12. At age 14 she won her first contest singing lead in a pick-up quartet at one of the Sons of the Severn Annual Barbershop picnics. The prize ….a 51 lb. watermelon! She was hooked…. Though life and all its interesting adventures diverted her attention for a bit, but she was back in the Barbershop arena for good in 1981. 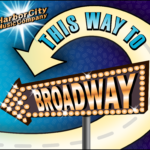 Singing in the Harbor City Music Company Show Chorus has had an incredible impact on her life and singing under the direction of her husband, Michael Gellert is just the icing on the cake. She has sung in several competing quartets both lead and baritone, Sizzle and Sass, Madison Avenue, Vogue , and over the years several non-competing combinations …each has brought great experiences, personal growth and fabulous, lasting friendships. Marianna resides in Severna Park, MD. Her days are filled with family commitments, fabulous grandchildren, work, chorus and now once again quarteting. 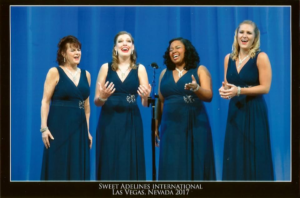 Marianna feels that Sweet Adelines has a way of safely allowing one to find their gifts and grow on so many levels. She has grabbed that opportunity and tapped into the creative side of that crazy brain of hers. She is a very hands on member of HCMC, heading up the make-up team, dabbling.. ..(though some may call it “badgering”) in the costume committee, but takes a special interest in being on the creative team which brainstorms and brings to reality fabulous show packages for international competitions, annual shows and SO much more. Feeling lucky and blessed in so many areas of her life, Marianna looks forward to yet another new adventure of singing with NEON LIGHTS. Ashley has been singing barbershop for 12 years. She is a member of the Harbor City Music Company Show Chorus, where she is a part of the Music Team and Captain of the Physical Warm-Up Team. Ashley has sung in various regional medaling quartets: Whole Lotta’ Harmony & Mixology. Ashley resides in Baltimore County where she attended Morgan State University and traveled the world with the Morgan State Choir. Ashley has a huge background in musical theatre and classical training. In Maryland, you might have seen her perform in various musicals with lead/supporting roles at Toby’s Dinner Theatre. Another fun fact, in 2011 Ashley won the Best Baltimore’s Idol Contest. She won singing Carrie Underwood’s “Cowboy Casanova” and Tina Turner’s “Proud Mary”. During the day, Ashley works in the Finance Department at Maxim Healthcare Services and at night, enjoys spending time with her husband & daughter. In her spare time, she enjoys coaching youth quartets, performing in musicals, judging singing contests and cooking/baking. Ashley is enjoying this her new musical journey with Neon Lights. 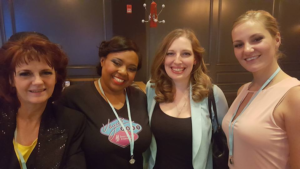 Kayla joined Sweet Adelines December 2015, however, singing has always been a part of her life. She has studied voice for 16 years and earned a BA in Music Performance from Millersville University. Kayla is passionate about music and has been trained in both musical theater and classically as a soprano. She has been involved in many shows and is pursuing a career in performing. Kayla resides in Lancaster, Pennsylvania where she is a member of the Red Rose City Chorus. She is a section leader for the tenors as well as part of the Personal Vocal Instruction Team. Kayla was introduced to barbershop through her wonderful husband, Shaun Ressler, who is a member of BHS. After getting connected with the Red Rose City Chorus and experiencing barbershop music, she was hooked and wanted to compete in a quartet. She is thrilled to be joining Neon Lights as their lead! During her spare time, Kayla is involved in her church choir and leads music for the children’s Sunday School class. She can often be found in some sort of rehearsal for a show or musical. She also enjoys spending time with her husband and family, reading, baking, dancing, Disney, scuba diving, and traveling. Kayla is overjoyed to be a part of Neon Lights and making music with these exceptional ladies! Lainey only joined SAI in June of 2014, but she has been singing in some capacity or another for her entire life. She is a classically trained soprano and her background includes 19 years singing in countless choral, ensemble, and soloist settings with experiences focused in opera and musical theater. Lainey took a brief break from singing after attending Towson University to get her career off and running, but after three years realized there was something missing in her life – music! Barbershop has been a wonderful fit for this passionate and competitive singer, and she was ready to jump in with both feet when she was introduced to the wonderful world of barbershop. Now she’s back at it with her first quartet, Neon Lights, and Harbor City Music Company Show Chorus, and she’s loving every minute of it. During the day, Lainey is known as “Elaine” and is the marketing manager for a non-profit. She loves relaxing at home in Arnold, MD with her golden retriever, and in her spare moments she enjoys reading, binge-watching Netflix, and spending time with her wonderful friends and family.